WOW! Here is the complete original John Carpenter MELTDOWN screenplay! The script is masterfully written in many ways and a complete joy to read. The dramatic premise is intriguing. The characters, though certainly on the thin side, are sympathetic and real, and the dialogue created to express their points of view is effective throughout. The visuals, the action, the topography of the space… all are exceptionally well crafted. The script is also very much a product of its time. While the Fukushima partial meltdown of 2+ years ago is still creating a sort of rolling disaster, it can’t be said that there is actually a great deal of public American fear, suspicion, anger, or even upset at the issue of nuclear power itself. While this script does present an interesting plot in and of itself, it’s undeniably a political polemic against nuclear power and against technology in general. It’s difficult to fully gauge how this subject matter would land in the culture of today given all the other things that the general public is concerned about, and the vast shift toward mechanization that’s happened in the 33 years since this story was written. In order to make this script work, it would either require a commitment to present this nearly as-is, in the context of 1980 with only a minor shift towards stronger logic and emotional substantiation… or require virtually a page one rewrite placed today. To commit to it as it is, placing it still in 1980, in effect the film would become itself a time capsule, shining a light perhaps on what we should still be gravely concerned about but have forgotten in our shifting focus towards other fears. There are shades of (future) terrorism, climate change, and remote military murders in here. The connection to the story being relevant today could be made from the view of darkly ironic hindsight. Our current culture espouses much different fears now, but it’s not impossible to track them as a sort of offspring of the fears capitalized upon in this script. It could work as a sort of objectified view of every crime we’ve committed against our environment since then, including the Fukushima disaster. It’s not clear how well that would in terms of marketing but considering the source, this film would certainly gain a lot of interest. The aspect of fear of technology would also have to be something to be looked at, as debating the usefulness or ubiquity of technology is no longer a powerful, persuasive argument. While this is secondary in many ways to the larger threat of the meltdown, it is fear (and misunderstanding/misuse) of technology that fuels that primary fear. Viewed from 2013, that 1980 suspicion of technology seems almost naïve or quaint. Yes – as we hear more about government spying and drone warfare, technology can seem just as invasive and destructive as a nuclear meltdown, but that fear doesn’t come from a place of innocence anymore. We’re far more aware of the assets and liabilities of technology, but indisputably we’re far more comfortable with its existence in our daily lives. It’s not clear how effective a film could really be in this modern culture that’s based on suspicion of technology from such a theoretical point of view. If, however, the story is meant to take place now, this would obviously require a major rewrite, not necessarily in terms of plot, or even much of the dialogue, plot, etc., but to make it feel current in the more emotional/cerebral content. There are several relatively superficial adjustments that would have to be made. Including modern technology is the most fundamental of these shifts, but the dreaded fear of radioactive material and nuclear power in general is simply not the same thing in our culture anymore. It doesn’t carry nearly the weight that it did in the 1980s regardless of what’s still happening in Japan and the Pacific Ocean. That fear exists, but to have full impact, it would have to be substantiated. How nuclear power is generated, the effects of radiation, and the risks of widespread contamination would probably have to be explained to a much further degree in the script than it is in this draft. The demographic for this film, today, probably doesn’t know who Karen Silkwood is or why anyone would want her dead. There are tours of Chernobyl. That reality has to be accounted for now. Updating it would also mean updating it to some extent structurally. While it’s nearly perfect structure for 1980, the condensing that screenplays have gone through even in the past decade makes the script overly long, and the second act of this script feel slow and a bit soft. The major shift in the story, the first real murder, doesn’t happen until page 59. That’s terribly late for a modern film. While there’s a terrifically crafted sense of tension all through the second act, so little actually happens in terms of making progress towards the stated goal that there’s very little movement. The conflict of the rogue “figure” also takes rather too long to heighten, not just in terms of actual murders, but in terms of making it progressively and exponentially harder on the group of seven to accomplish anything that could be perceived as progress. In terms of looking at the conflict, while obviously the big stakes are overall extremely high, there are not many personal stakes being explored or expressed here. While much of the character work is excellent, there is so little internal story happening for any of the characters that it’s hard to get a handle of what any of this means for them as people. There’s a great detail when Teresa sends in a message not to tell her mother what’s happening. It’s a terrific little moment. But it also stands out as being significantly more personal and specific than almost any other moment in the script. We know next to nothing about any of these people in terms of what skills, strengths and weaknesses any of them have. While the script is rather exciting and frightening in many ways, the lack of individual definition is undercutting the potential that the script could have to be equally valid as a character study in an intensely stressful crises situation. There is only one real relationship in the story (between Kneale and Parks) and this is another place that the story could be strengthened, no matter when it takes place. These people are meant to have been working closely together for some time now. While the group of five co-workers is comprised of scientists, there is every reason to make them as human, relatable, and nuanced as possible. The best place to explore that is to dive more deeply in the relationships between them. To allow them to push each other’s buttons almost as much or more as the external forces working against them would be highly effective. There’s a great deal of room to play with here, and while it needn’t highjack the importance of the outside influences, the concept of “fighting the devil within” can be brought a little more close to home. The last thing to really consider is the role of the “figure”. What he wants, why he wants it, what he’s hoping to actually accomplish, and how are all things that aren’t quite holding up at present, and would want to a look regardless of the time setting of the story. Some of how it’s being currently handled does seem in some ways to be a product of the time when the script was originally written. We still have single, insane “boogeymen” out there in the world and showing up as villains in our modern stories. And they’re just as driven by high ideals as they are in this story. But there’s a bit of a mixture of all different kinds of crazy in this story’s villain that don’t quite add up. Just as an example, the figure seems to kill people in many different ways. He sets some people on fire. Drops others in radioactive liquid. Attacks some with power tools. The killer has no consistent MO. The murders don’t say anything about him other than he’s a killer. There’s no signature. Another element of the “figure” that’s not quite landing is all the messages and poetry he’s putting around the building. Since he’s planning on destroying the plant, who is he leaving this poetry for? It would only be communication if there were something left to show people, but his plan is to raze the whole power plant in a conflagration of total destruction. That poetry is going to disappear. That video will disappear. There’s really no reason even to go around and intentionally murder these seven people since they will die far more easily if simply locked inside the plant and left to their own devices. The group of seven walk into a situation when they enter the plant where the “figure” already completely has the upper hand, and there’s literally no way for them to do anything. They don’t know this at first, of course, but the whole course of the story is literally a lost cause from page 2. Of course the plot is largely about seven to ten people getting picked off one by one, and that shouldn’t necessarily be removed because it’s illogical from an omniscient point of view. But it does mean that every effort should be made to make it logical. The poetry might be spooky and effective on some level, but it’s got to be distributed in a way that makes sense, and would reach the world in order to make a deliberate statement. The “figure” is trying to warn humanity of its hubris, but he’s simultaneously engaging in an act that will ensure that his message never reaches the world intact. The world would be left to interpret it however the owners of the plant deliver the narrative to the media. Again, none of these things are deal breakers in terms of the potential effectiveness of the story, but they need to be handled in a way so as not to raise more questions than answers in terms of motivation and follow-through. A great read, a truly great script in many regards. The fact that it would want a great deal of work to move forward into production is not a criticism of the piece as much as it is a commentary on how much the film industry and the world has changed in 33 years. It’s just not the same world. It feels rather absurd in the light of Fukushima to say that nuclear power just isn’t a deeply vital issue anymore, but truthfully, it simply isn’t. It’s still a scientific and political issue, but it’s not a cultural one in modern America. To the ordinary person, the expected demographic for a film of this size…sadly, it’s going to be a bit of an uphill battle to really engage the hearts and minds of middle America who are far more afraid of being jobless than they are of being poisoned by toxic waste. Coverage written by DB, Script-Fix reader. Jox wrote: WOW! 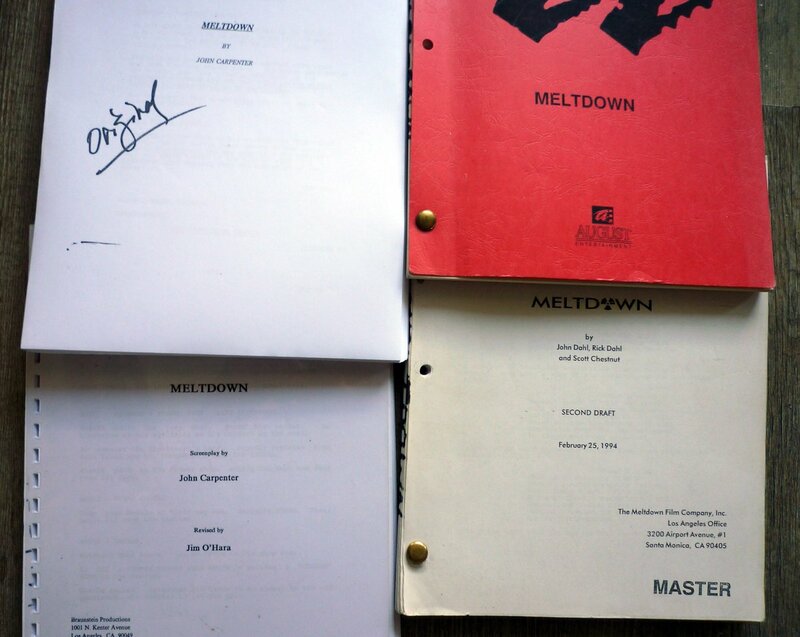 Here is the complete original John Carpenter MELTDOWN screenplay! Indeed the original John Carpenter script (1978) seems very different from the version(s) Dolph had been attached later on. This was more of a suspense / horror thriller à la "HALLOWEEN in a nuclear plant (which would have worked well back then in the late 70s early 80s) than a "DIE-HARD in a nuclear plant". Dolph had signed on to the project after UNIVERSAL SOLDIER in 1992, around the same time as JOSHUA TREE. Canadian director Yves Simoneau was to direct. It didn't get to production then so it got into turnaround until the project was relaunched in 1994 with John Dahl at the helm. Production got shut down in June 1994 only days before filming because of a big legal dispute between distributors Miramax, Trimark and August Entertainment. This April 1995 draft is from after John Dahl dropped out of the director's chair since the legal issues and shortly before Dolph left as well. Dutch director Ate de Jong was then attached to direct (as he was in 1997 when they reannounced it with Dolph look-alike Casper Van Dien starring). Rare early 1987 screenplay (revised by Michael Campus). This is 5 years before Dolph got attached to star in it. Super rare trade advert from the AFM late February 1992.